A new in-depth sportingintelligence analysis of the play-off winners during the 23 seasons of the play-offs’ existence in English football suggests that Blackpool have statistical history on their side when they face Cardiff tomorrow in the Championship play-off final at Wembley. The Welsh team may be the favourites, but the numbers say the Lancastrian Oranjie have the edge in the richest fixture in global sport; £90m-plus is at stake in one game. Statistically, the most likely team to win the Championship play-off is the team that finishes third in the table at the end of the regular season, or top of the play-off “zone”. In 23 seasons since 1987, the team occupying the highest place in the zone has won the play-offs eight times, or 35 per cent of the time. The teams finishing second in the play-off zone have the worst record, with just four wins in 23 years, or a 17 per cent success rate. The teams finishing third in the play-off zone have a 26 per cent success rate, and those fourth in the zone have a 22 per cent success rate. Blackpool finished sixth in the Championship (fourth in the zone), and so have a 22 per cent chance of glory, so the stats say. Cardiff were fourth in the Championship, thus second in the zone, and thus have a 17 per cent chance. 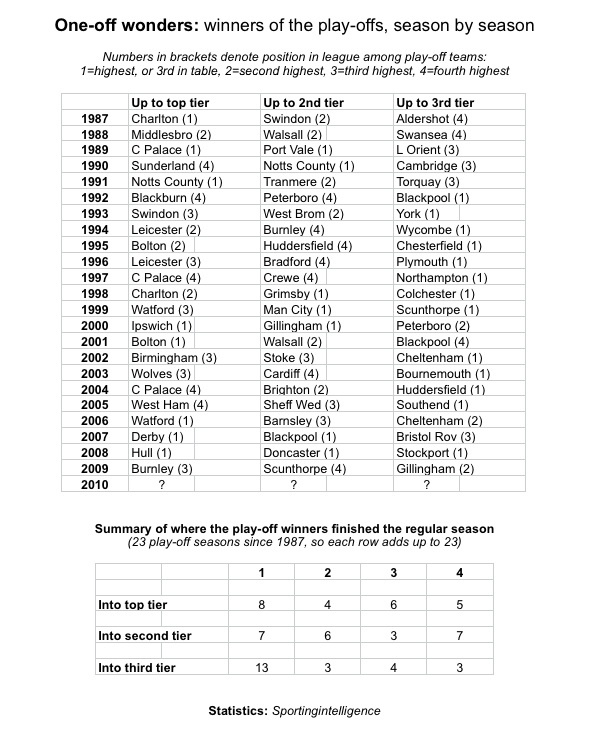 Our top table below (‘One-off wonders: winners of the play-offs, season by season’) details who won the play-offs every season between 1987 and last season, by division, and the summary shows the “origin” of the winning teams. The line “Into top tier” shows you, for example, that the team in pole position in the play-off zone in the Championship (or equivalent) won eight times, the team in second place in the zone won four, and so on. The stats in our other table, ‘Play-off pedigree’, also suggest Blackpool can rock Wembley. They have been involved in play-offs five times, reaching four finals and winning three, for a 60 per cent success rate, albeit never with a place in the Premier League at stake. Cardiff have been in three play-off campaigns (none of them for the Premier League), and won only one promotion, for a 33.33 per cent success rate. When it comes to next weekend’s play-off finals in League One and League Two, the statistics are slightly less conclusive. Millwall should win based on the historical success rate of teams in their position in their league, having finished top in their play-off zone; seven teams from 23 have won from that spot in that division, against three teams from 23 occupying the third spot in the zone which Swindon finished in. But Millwall have never been promoted via the play-offs despite five play-off campaigns (a zero per cent success rate), while Swindon have won three of five play-off campaigns (60 per cent). So who knows? Not us. And not even the stats. If anything, the League Two play-off is wider open still. Dagenham & Redbridge have no play-off pedigree and Rotherham have never been promoted via the play-offs. Their finishing positions in the league do not help us much either. The team that tops the play-zone in the fourth tier, statistically, should be hot favourites to win the play-offs, having done so in 13 of 23 years (57 per cent success rate). But Morecambe filled that slot this season and lost to Dagenham in the play-off semis. Rotherham (second in the zone), and Dagenham (fourth) both started the play-offs with a 13 per cent chance (three of 23), statistically, of winning the play-offs. Unlucky for one, we say. So are the play-offs fair? They have certainly added spice to the season, and we could argue, statistically, that the play-offs have coincided with a steady increase in crowd levels, to a 50-year high in the three divisions of the Football League this season. But are they equitable? Do they, on balance, reward the teams who finish higher up the table in the regular season. The answer is a qualified “yes” in as much as 28 of 69 play-off winners (or 40.6 per cent, or the largest single lump) across all divisions over 23 years have come from the No1 slot in the respective “zones”. But of course there have been losers too. What do Nottingham Forest, Millwall and Morecambe have in common with Sheffield United, MK Dons and Bury? They are the clubs this season and last season that would have been promoted if the play-off system were not in place. They are the clubs that finished closest to automatic promotion in their respective divisions. And Sheffield United, MK Dons and Bury will testify to the lottery misery of the play-offs: not one of those “pole position” play-off clubs of a year ago ended up being promoted. Forest and Morecambe have also fallen by the wayside this term, with only Millwall flying the flag for the “pole position clubs” this season. Before last season, there had only been one other year that no “pole position” club had gained promotion and that had been way back in 1988. And two years ago, for only the first time in the 23 competitions, all three “pole position” clubs – Hull,Doncaster and Stockport – all won their play-off finals to be promoted.